Well, first, hop on a plane to Egypt and take a photo of yourself in Tahrir Square. Then, e-mail it to us and if the current government is overthrown in the next week or so, we’ll send you the ebook. Just joking. It’s simple, easy, and, best of all, free! All you have to do is subscribe to this blog by e-mail. Then, check your inbox for the confirmation e-mail (if it isn’t there, check your spam folder). In that e-mail will be the instructions on where to go to download the ebook. If you have any trouble, e-mail us and we’ll see what we can do (more detailed instructions are at the bottom of the page or the sidebar at right). At this point, you’re either wondering, “What makes this book so great?” or, “When’s the last time I put on deodorant?” We can answer the first one, but, well, as for the second one, we just hope it was in the last decade or so. Seriously, though, this book has terrific value (mostly because it’s free, so if it is any good, it is automatically more valuable than ‘free’). It’s got over 5,500 words. It’s got 19 (hand drawn on the computer) original pictures. It’s got our names on it (what more could you need?). And, as an added bonus, there’s a surprise at the end (you’ll have to get the book to find out what it is). “The best book in the world. I really can’t say enough good things about this book. Honestly, I died laughing at least thirty times. Even after paying for the cost of thirty funerals, I still just won’t shut up about how good this book is.”-Phil DaBlogger, author. 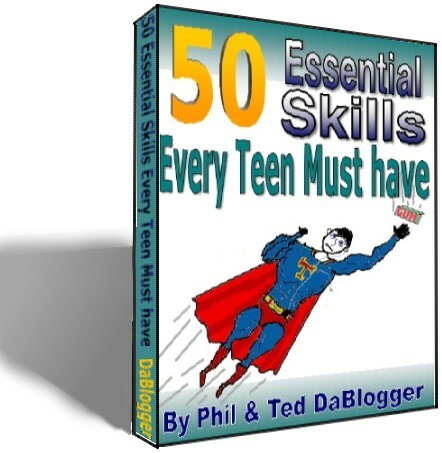 Whether you’re a teen or not, this e-book is for you. Why? 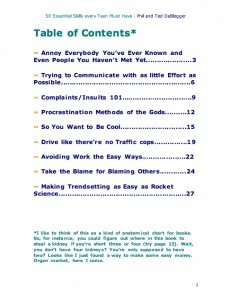 Because (watch this) I can easily change the title to fit whatever you are; for instance: 50 Essential Skills Every Cantankerous Retiree Needs. Or, how about 50 Essential Skills Every Disgraced Congressman Needs. See? It’s that easy (keep in mind that most of these skills are directed towards teens, and that a few might result in major damage of some sort to a Retiree or Congressman). More specifically, I think that you should read this ebook. Why? Because we wrote it for you (just kidding-I’m just trying to get you to read it. We really wrote this ebook because we lost a bet. The bet? I won’t go into specifics, but something about how many alien abductions would occur this year. Needless to say, we under-guessed). Well, first, obviously, it’s supposed to be funny. If you want a laugh, you should read this book. But that’s not the only reason. As an added bonus in the book, I (Phil) insult my sense of humor. You don’t even have to think of an insult for me, because it’s right there in the book! But WAIT! If you download it now, I’ll throw in some solid gold diamonds! And that didn’t even make sense, it was such a good offer! But it doesn’t matter, because “now” was 5.27 seconds ago and you just missed that TERRIFIC offer! “If I were marooned on a desert island, I definitely wouldn’t take this book. I’d rather take a survival guide, or maybe a book on boat building.”-Phil DaBlogger, author. “Guests, like fish, begin to smell after three days.”-Benjamin Franklin, philosopher. “Grrrrrreat!”-Tony the Tiger, animal-turned-cereal marketer. “Really, you need to read this book. If you haven’t yet, you need to. It’s the funniest thing I’ve ever read in my life, even funnier than ‘A Communist Manifesto.’”-Phil DaBlogger, author. “If you’re reading this, you haven’t got the book yet! What do you think you are doing? Haven’t you realize these testimonials are useless? What made you think the 5th one down the list would be any more helpful than the first? You really ought to get this book.”-Phil DaBlogger, author. 1). The big green button will take you to the feedburner e-mail subscription form. Feedburner and we are the only people who will ever see your e-mail address (feedburner is a Google product and is spam-free, and we promise that we won’t send you any spam either). Just fill in your e-mail address and the captcha code. 2). Then, check your inbox for an e-mail from “noreply+feedproxy@google.com” or some other feedburner/google email account (with a subject line of: “Feeburner Email Subscriptions”). That e-mail is extremely important, so if you don’t see it, check your spam folder. 3). In that e-mail, there will be instructions on how to download the e-book and a confirmation link to confirm your e-mail subscription (which you will have to click to get the ebook-you’ll see what I mean when you get the e-mail). If you have any questions, concerns, or problems, send us an e-mail and we’ll be glad to try to help you out. (Here’s another button, in case you missed the firs one, or your scroll bar is broken, or you are too lazy to scroll up, or in case somebody steals the first one because I didn’t chain it to a lamp post). 1). The big green button will take you to the feedburner e-mail subscription form. Feedburner and we are the only people who will ever see your e-mail address (feedburner is a Google product and is spam-free, and we promise that we won't send you any spam either). Just fill in your e-mail address and the captcha code. 2). Then, check your inbox for an e-mail from "noreply+feedproxy@google.com" or some other feedburner/google email account. That e-mail is extremely important, so if you don't see it, check your spam folder. 3). In that e-mail, there will be instructions on how to download the e-book and a confirmation link to confirm your e-mail subscription (which you will have to click to get the ebook-you'll see what I mean when you get the e-mail). If you have any questions, concerns, or problems, send us an e-mail and we'll be glad to try to help you out. What are you doing, looking in the sidebar? You should be focused on getting our e-book. It's better than anything we could have put in the sidebar. Trust us.